Have you ever had someone tell you “Didn’t you get my email?”. The problem can be that Outlook sees the address as junk mail. Here’s how to manually or automatically add them to the Safe Senders List. Have you ever had someone tell you “Didn’t you get my email?”. The problem can be that Outlook sees the address as junk mail. 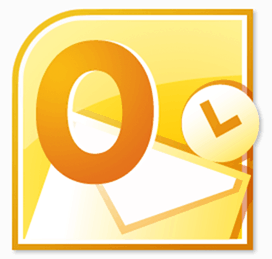 Here’s how to add email contacts to the Safe Sender List in Outlook 2010 so you won’t miss another important message. Open Outlook and click the Home tab. Then click the Junk button and select Junk E-mail Options. Junk E-mail Options comes up. 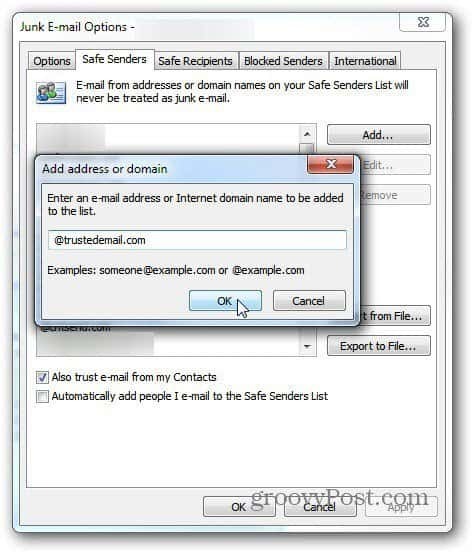 Click the Safe Senders tab, the Add button, type in the trusted domain or email address and click OK.
Another option to automatically add trusted email addresses is to check Automatically Add People I Email to the Safe Senders List. 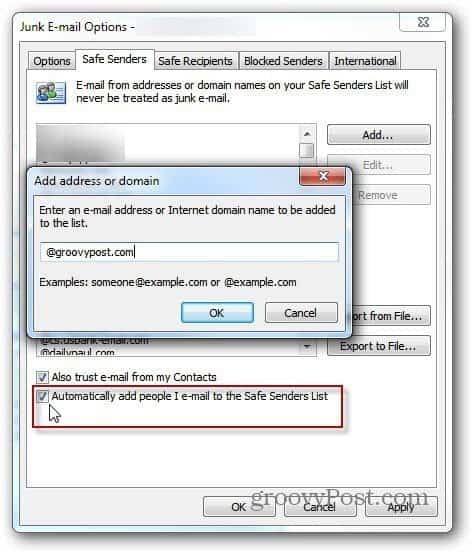 Using that option automatically adds the people you email to the Safe Senders List. And you’re only emailing trusted sources right?